Jeff Ziebart building a Nola Night Fuzz pedal. Kuciel pedals don't have cheap plastic casings that will do the splits on that all important gig or studio session. Kuciel pedals don't have low quality internal electronic components that will add tons of hiss and unwanted noise to your rig. Kuciel pedals are not made by people who have never played a guitar or don't even know what a fuzz pedal is. Kuciel pedals are not made by automated machines in large factories. Kuciel pedals have thick aluminum cases that will last you many, many, many years. Kuciel pedals use top grade electronic components..
Our pedals are hand-built, one at a time by Master Technician Jeff Ziebart of "Fish Custom Guitars". Our pedals feature discrete components and hand-soldered circuits. Kuciel Pedals are tested right before they are shipped to you, to ensure you have a well-working, great-sounding, and reliable unit. Our pedals are made right here in Kelowna, B.C., Canada. Kuciel Pedals come with a 1 year limited warrantee. We will ship your pedal to anywhere in the world. 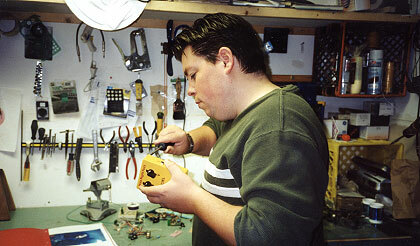 Each pedal is hand crafted by effects wizard Jeff Ziebart to his exactling standards. Each Kuciel pedal is built with the studio and stage in mind. Studio quality and gig reliable components make each Kuciel pedal a marriage made in Musician Paradise.